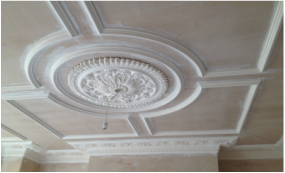 Frequently customers ask if we provide plaster coving pre made corners. Well, here are advantages and disadvantages by doing this. We can supply you with pre made corners for any of our coving we sale and the cost will depend on the style and the size of the plaster coving. These all sounds very good and simple until you get to installation process and realize the major disadvantage. None of the room corners where you want to use cornicing are perfectly 90 degrees. As with pre made comer you will be dealing with two joints, these joints will never be matched. So we strongly suggest that you cut the mitres by using a mitre box with a fine tooth wood saw and the work not only is done nicely but you are saving huge!